Arriving at Machu Picchu by bus is definitely less of an event than getting your first view from the Sun Gate after being on the trail for four days – but it’s certainly easier. Even arriving at 6.30am, it was busy, and after going to see the Inca Bridge tucked away to the side (yet another puzzling construction of a path built against a high, sheer cliff), by the time we met the rest of the group the site was crowded. It was a slow business, working our way around a circuit with Eddie giving us the commentary, having to wait for other guides to finish their spiels, and also for people to take their photos. Many of these were young women, I’m afraid, treating this amazing place as a setting for their poses, flitting from one dramatic backdrop to another, without ever seeming to look at it properly. Hard not to disapprove. So there were the usual marvels of stonework (tools only of copper, tin or bronze to work the granite), astronomical and meteorological features, puzzles over form and function, bits of history, fact and speculation. There were even chinchillas and llamas. We trailed around in increasing sunshine, past llamas close-grazing the grass, workers scratching lichen off the stone with bamboo sticks, guards trying to control tourists who thought ropes don’t apply to them. It’s a Wonder of the World, truly, and words can’t do it justice. Seeing it for the second time was naturally slightly less impressive, though, and I had a background buzz going on about how to get up Huaya Picchu, This is the tall mountain you see behind the site in most photos, and you need to have booked a ticket to climb it. I didn’t, by some mistake, but Colleen did, and since she is at least twice my size, there was no way she was going to be climbing 360 vertical metres up uneven steps with no hand railing. Trouble is, you need a passport to go with the ticket, and Colleen is Hispanic. “It won’t work: you’re too blonde,” scoffed Eddie - with some tact, it must be said (twice as big, remember). But it did: the attendant scarcely glanced at the US passport I offered with the ticket, and waved me through. I had committed passport fraud! I’d also committed myself to climbing all the way up Huayna Picchu, which turned out to involve 45 minutes of sweat, heavy breathing and a pounding heart. The steps were uneven, they were steep, they went on and on, there was a flight cheerfully known at the Death Steps, and finally there was a tunnel to crawl through – but eventually I got there. Was it worth it? Actually, for the view, no. 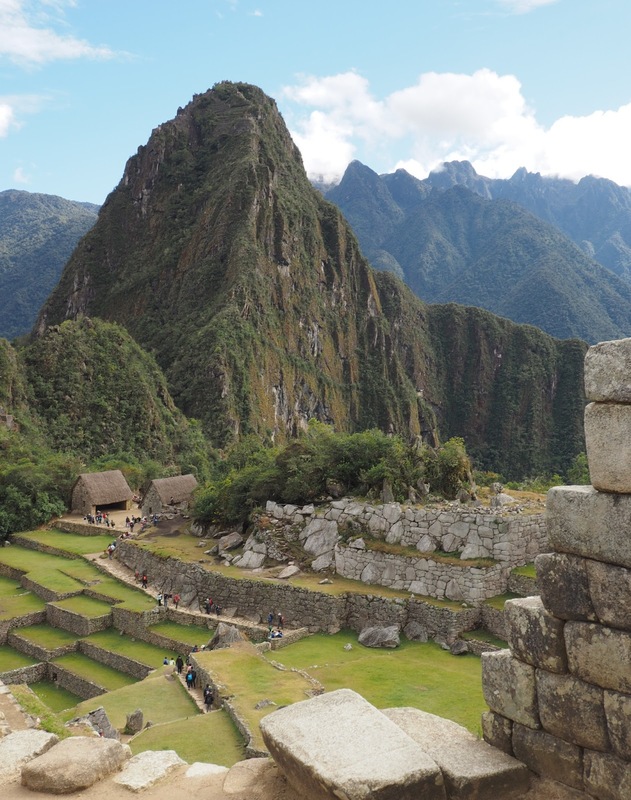 It was too high, you see: Machu Piccchu's detail was simply too far away to see properly. But for the sense of accomplishment? Oh yes, definitely. I'm pleased and proud to have done it, there and back in under two hours. Tick.